Japan is a part of the Eurasia continent and made up of more than 6,000 islands. 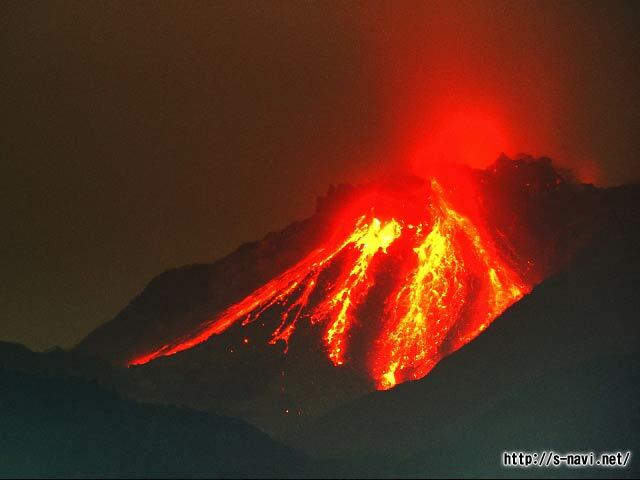 Also, it is fomed on the volcanic line, called " Ring of Fire ." Many scientists believe that most of Japan Islands were under the sea before Miocene . (1) Lifting Japan islands started in the early Miocene by volcanic activities that was related to the shift trenches of the Pacific, Eurasia, and Philippine plates. In the late Miocene, the current Japan Islands were formed by shifting volcanic-arcs from the back-arc to the front –arc when the trenches moved back the trenches. Also, most volcanoes which created the formation of the current Japan Islands exhausted, and they disappeared in the early Miocene that they left scars of their activities on the surface. Most current volcanoes have been active since Holocene and have mainly formed stratovolcano . Some active volcanoes have been studied to understand the intensiveness and scale of volcanic hazards from thier eruptions. Moreover, the volcanic hazards in Japan are very similar to the hazards of the Cascade volcanoes in the United States because both volcanic activities are linked together by the "Ring of Fire." (1) Takeyoshi, Yoshida. "Tertiary Ishizuchi Cauldron, Southwestern Japan Arc: Formation by Ring Fracture Subsidence." Journal of Geophysical Research, Vol. 89, No. B10, Pages 8502-8510, September 30, 1984. In Japan, the volcanic activities have changed scale and characteristics of the eruptions. During Miocene , the stress fields were located between northeast (NE) and southeast (SW) and frequentry moved thier positions.. The stress field produced a large size of batholiths underground and developed many caldera volcanoes on the surface. 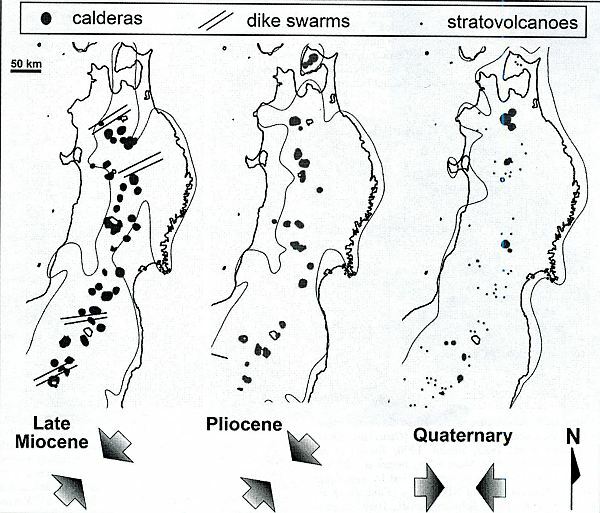 After Miocene, most caldera volcanoes disappeared while many stratovolcanoes were formed, because the stress fields changed their directions from NE and SW to east and west (1). Today, there are more than 80 historical volcanoes and 85 active volcanoes in Japan (2). Also, the historical volcanoes that were formed in Miocene are used to study relationships between volcanic and plutonic activities. Also, active volcanoes that were formed after Miocene are used to develop models and study volcanic hazards. Figure from Acoclella, et.al., 2008. Acocella, V., Yoshida, T., Yamada, R., and Funiciello, F. "Structural control on late Miocene to Quaternary volcanism in the NE Honshu arc, Japan." Tectonics, Vol. 27, TC5008, doi:10.1029/2008TC002296, 2008. Most of active volcanoes in Japan formed stratovolcanoes or complex volcano. These volcanoes potentially produce the volcanic hazards such as pyloclastic flows, laha, volcanic bombs, ash falls potentially that travel faster and longer distances. Because Japan volcanic-arc is linked to the Cascade Volcanic-arc by the Ring of Fire , the volcanic hazrds in Japan are very similar to the hazards in the Cascade volcanoes, for example Mt. St. Helens eruption in1980 (1). Some of those volcanoes are located near highly populated areas. People in areas often face to the serious volcanic hazards when the volcanoes erupt, for example Unzen and Sakura-jima volcanoes. (1) R S Bernstein, P J Baxter, H Falk, R Ing, L Foster, and F. "FrostImmediate public health concerns and actions in volcanic eruptions: lessons from the Mount St. Helens eruptions, May 18-October 18, 1980. "Am J Public Health. 76(Suppl): 25–37, 1986 March. (2) Map courtesy of the USGS “Major Volcanoes in Japan.” May 13, 2003. Today, some of active volcanoes which potentially produce serious volcanic hazards including pyroclastic flows, laha, ash fall, and volcanic bombs are located near big cities. The Japan Meteorological Agency uses a rank of time scale and a table for alert levels in different intensity of volcanic activities and notify people in the cities for their protection. Unzen Volcano is one of the most famous active volcanoes in Japan. The volcano is located in the northwestern Kyushu Island, Japan and is also sitting near the big city named Shimabara. 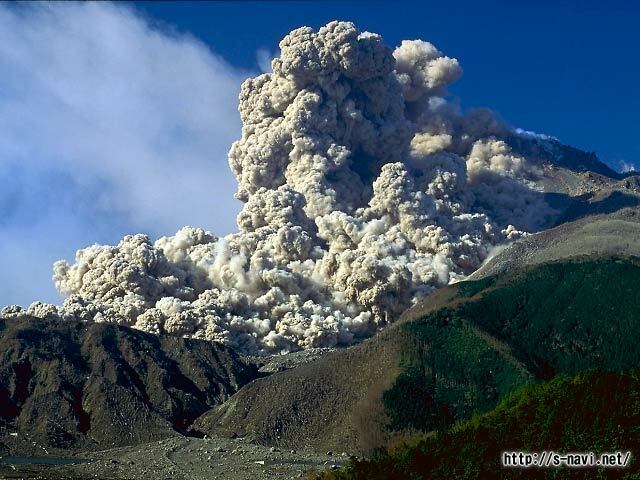 In November, 1989, scientists observed the first volcanic earthquakes and found the first eruption on February 12, 1990. The most recent eruption occurred on February 10, 1996. Between 1990 and 1996, the Unzen volcano created a magma dome and produced various sizes of pyroclastic flows more than 10,000 times by collapsing the surface of the magma dome . Also, the volcano produced laha many times and destroyed more than 2,000 building during those years. In 1993, the lava dome collapsed and produced the biggest pyloclastic flows. Totally, 44 people were killed and 12 people were injured by the pyroclastic flow (1). Sakura-jima volcano that is located in the suthernwest Kyushu Island is the most active stratovolcano in Japan. The resent eruption occurred at 2 a.m. on May 11, 2010. The eruption was a small scale, but the observatory recorded more than 500 eruptions in 2010. Now the elevation of the volcano is 1,117m, and produced 17x23 km wide of caldera on the peak. Because this volcano is also sitting near the large city, called Kagoshima City, the historical records show that the volcano produced pyroclastic flows and laha when the eruption was higher than Volcanic Explosivity Index (VEI) 3. Also, there were some people killed by the eruptions. The most recent eruption in 2010 was recorded VEI 3 (2). Some active volcanoes have been dormant for hundreds or thousands of years.. They created beautiful overview of their mountain ranges and forests around the vents. However, Japanese historians recorded volcanic hazards in reports, songs, and poems when they erupted. Mt. Fuji has the highest elevation in Japan, and is considered as a symbol of spaciousness, apotheosis, and dynamism. There are some scars of the eruptions on the surface of Mt. Fuji. The most intensive volcanic activities occurred between 9th and 11th Centuries (1), and the rmost recent eruption occurred in 1708, and was 5 in the Volcanic Explosivity Index (VEI). The eruptions in the early centuries were composed a poem or reported in books such as Manyoshu and Nihon Goki. Also, these books describes volcanic hazards such as laha and ash fall during the eruption, and the ash fall reached to Edo a former name of Tokyo by the Hoei eruption in 1707. The most recent eruption of Mt. Fuji was in 1707. 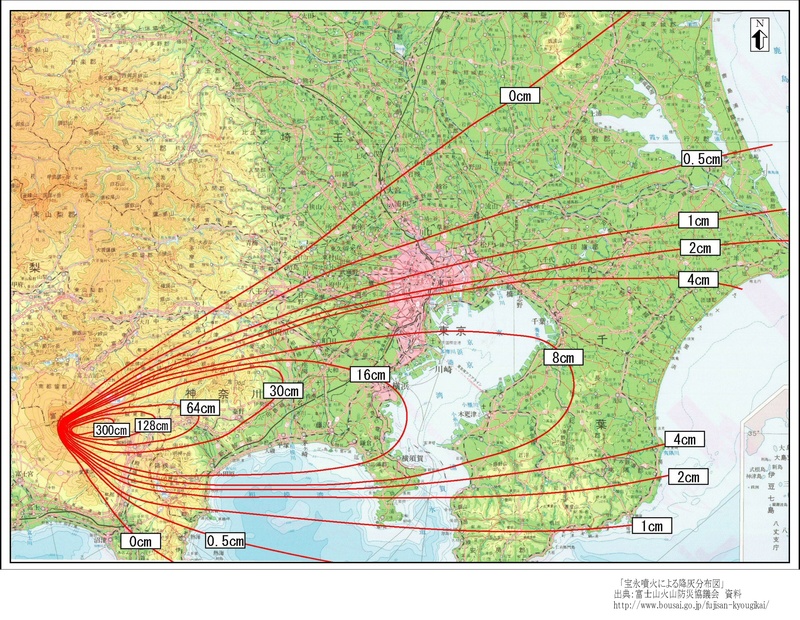 The map below shows that the ash traveled to east and covered whole area of Tokyo, Chiba, and Kanagawa during the erupted (2). Areas that were located closer from the vent recieved approximetly 300 cm ash deposit, while areas that were located far from the vent obtained no or a few centimeters of ash deposit. The eruption mainly produced pyroclastic flow , ash fall, and laha as volcanic hazards. Before the eruption, there were a lot of small villages and a couple of big towns near Mt. Fuji. However, a number of houses were burned, and many villages were destroyed. For example, villages in Kanagawa (southeast on the map) seriously damaged on flumes by laha, and the laha frequently occurred for several years after the eruption (3). Also, a large area of agricultural land was damaged by ash fall. During the eruption, people wrote a song to describe the volcanic hazard, like "Even going back to wind and grind it and this, You know too well know the cough Hokata" (1). (1) Kazuaki, Ito. "The classical view of the mountain erupted." Prevention newsletter 235. 2008. (2) Smithsonian National Musium of National History. "Sakra-jima." Global Volcanism Program. (3) Volcanic-ash-downfall map of Mt. Fuji Hoei Eruption. Online image. Wikipedia. March 21, 2006. Japan, base on histrical document." Rekishijishin. Vol. 18. 2002. Page 133-147.